Chase Twichell, one of America’s foremost poets, has spent years studying Zen Buddhism, and the balanced mystery and grace of her poems reflect the extent of that mental and spiritual application. 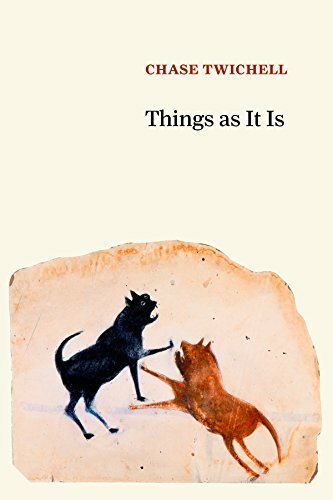 The title of this book, Things as It Is, in fact, is drawn from Suzuki Rōshi’s lecture on the Sandōkai. The plurality of the subject subsumed in the unexpected singularity of the predicate is entirely intentional. Not unlike the book’s title, the poems in this collection are predictably unpredictable. Twichell opens the book reminiscing about entering “Strangers’ Houses,” where “The greenhouse door/was kept locked, but kids/knew about the key.//Inside were aisles of orchids./It was like being inside a cloud.//,” in this instance, the matter-of-fact child, having gained access to an adult’s private hothouse treasures, converts the experience into simile. Twichell’s recollective poems are straightforward, unsentimental, and tinged with a strange eroticism. The hint of Rossetti’s Goblin Market is unmistakable. Even though these uncertain reconstructions of the past are darkened by time and imperfectly exposed, they are a far better testament than nothing at all. It’s hard to tell in Twichell’s work if we are dealing with art playing with life or life playing with art. In “The Ends of the World,” she conjures the Garden of Earthly Delights and laments that “. . . art can’t resurrect it./It only dreams it.//” Here, then, are the limits of art. Twichell dissects absence and loss in these poems, all the shapes and sizes, all the forms, figures, and shadows that populate the past and bleed into the future. And she agonizes over mankind’s assaults on the planet: the Great Pacific Garbage Patch, the silencing of the crickets, the constant tragedy of war. The sheer scope of the subject matter Twichell tackles occasionally causes transitional difficulties in the underlying structure of the book, difficulties which she sometimes, but not always, overcomes. But when she is on, she is on. She writes a whole series of poems for her mother, a woman who is beautiful, elegant, aging, dying, and finally gone. Loss and the accoutrements of loss. These poems are acknowledgements of grief as well as joy. Acceptances of both. And recognition that they are sometimes interchangeable. So here is a sharing of the ashes between generations, between the living and the dead, the lost product of our mutual fires. Truth and mystery do not often both escape, because then there would be no poem at all. Truth escapes, or the mystery which ultimately confirms the poem’s truth escapes. And then the poem itself is halting. Chase Twichell writes few such poems. Her work elementally contains both truth and mystery. Twichell then “. . . thought of writing on water,/writing on wind . . .” wind and water having become nonconstructs simultaneously transitioning back and forth from wind to water, from water to poem. Somewhere in the delicate and temporary balance of this suspension lies the mystery and truth of Twichell’s work. She challenges falling leaves to stop so that she can write on them. She begins a “Ghost Dress” from the indigo silk her mother left to her. She begins, but doesn’t finish. Twichell is a sound evaluator of truth and mystery, a clear-eyed aesthete, as well as a poet grounded in fields and farmland, dogs and water fowl. She values lilacs for the way they stand in for grief. She studies the language of sickness and death, of loss and misgiving. But Twichell knows these words already. They constitute the syntax and diction that characterize the poems in this collection, poems of balanced wildness and instinctual grace.